There are 6 Aid Stations for the 50k race. Aid Station # 1 will only have water, an electrolyte drink, and a light mix of supplies. Aid Stations #2 – #6 will be a mix of ultra-run cuisine such as pb&j, fruit, cookies, pretzels, chips, candy, salt, Coke, Mtn. Dew and more. There are 3 Aid Stations for the 25k race. Aid Station # 1 will only have water, an electrolyte drink, and a light mix of supplies. 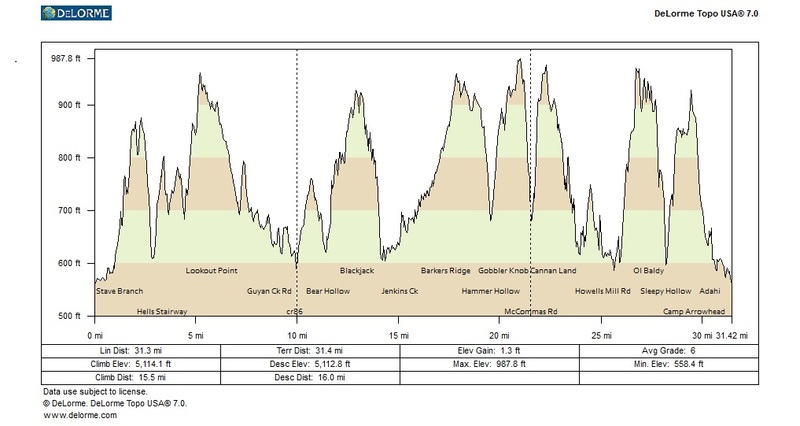 Aid Stations #2 – #3 will be a mix of ultra-run cuisine such as pb&j, fruit, cookies, pretzels, chips, candy, salt, Coke, Mtn. Dew and more. Start # 1 ? ? # 1 # 2 ? ? # 2 # 3 ? ? # 3 Finish ? ? There are 3 Aid Stations for the 10k race. Aid Stations will only have water, an electrolyte drink, and a light mix of supplies. 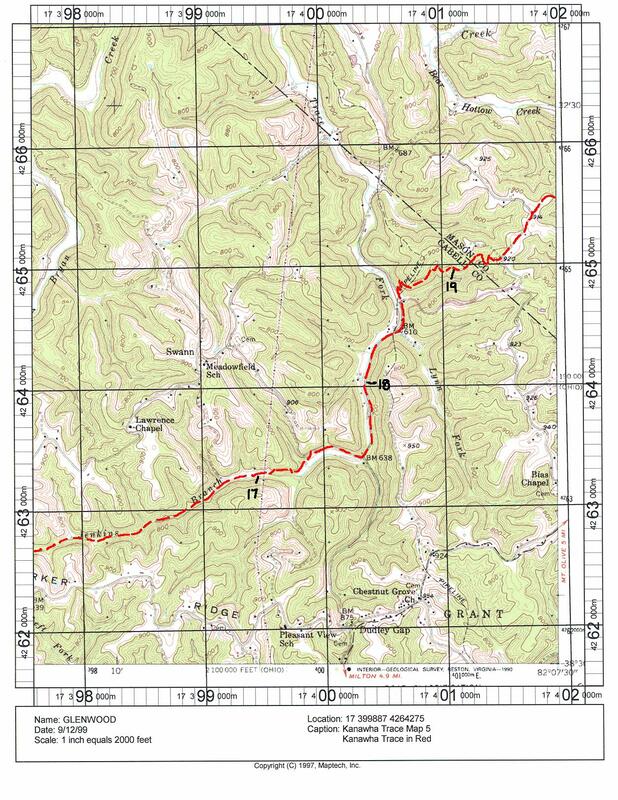 This detailed description of the 50K route has been prepared by Mark Freeman — a scout leader and hiker who is on portions of the trail almost every weekend. The Start is actually at ending point of the trail, so you will run it in reverse — east to west — with the mileage counting backward from 31.7 to the Finish. There will be portable toilets at the start of the race. Begin at mile 31.7 on Old Rt. 35 near Fraziers Bottom. Turn onto Stave Branch Rd. for 0.5. After crossing a small creek bridge, turn left into the woods at mile 31. Follow the creek until it turns right up the hill, where you will descend between two old rusty fences (caution as they are only a couple of feet apart). Cross another small creek and head uphill again. On top of the ridge, briefly follow a small four-wheeler trail downhill until the culvert tunnel under Rt. 35. Exiting the tunnel passes by mile 30. 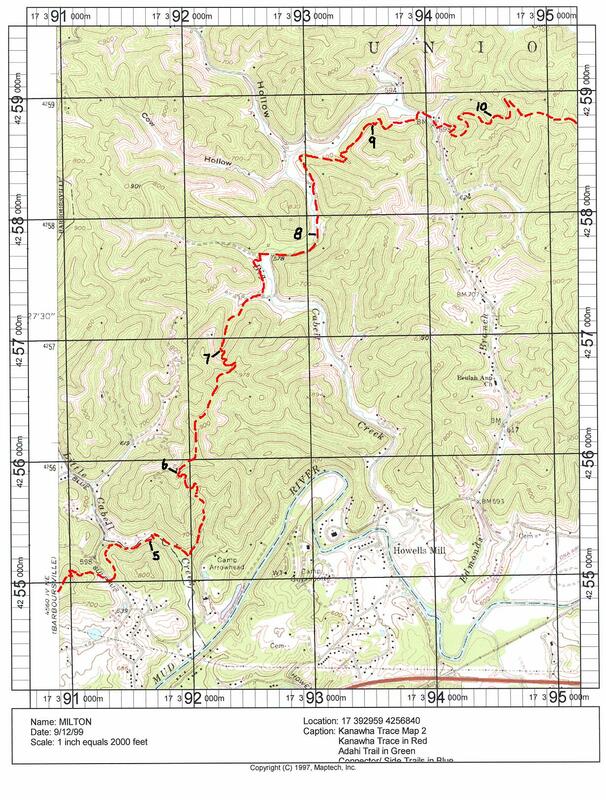 The trail loosely follows a creek until it powers uphill again and crosses an old logging road. Descend this hill known as “Hell’s Staircase” and cross the marshy bottom. Use the newly constructed bridge to again turn uphill passing mile 29 near the top. You will now be in a mountain-top meadow (pay attention to markers here, as there are several deceiving paths). Go through an area of cleared pines/firs with the appearance of a ‘natural tunnel’. Now in an area of a logging clear out, go downhill to mile 28. Use an old foot bridge to cross the cross the marshy bottom. Aid # 1 is at the crossing of Stave Branch Rd. Follow the markers up the power line until crossing the clearing and reentering the woods. There are several rolling hills through hardwoods and fern lined areas. Cross the gravel road and climb the embankment back into the woods. Cross the the yard of the camp area (use caution to avoid the landowner’s horseshoe posts). Mile 27 is back in the woods. Exit the woods onto a long road section. Pass mile 26 and Aid # 2 is at Mt. Zion Church. Enter Mason Rd. (which may be busy) and turn left onto Guyan Creek Rd. following the gravel. 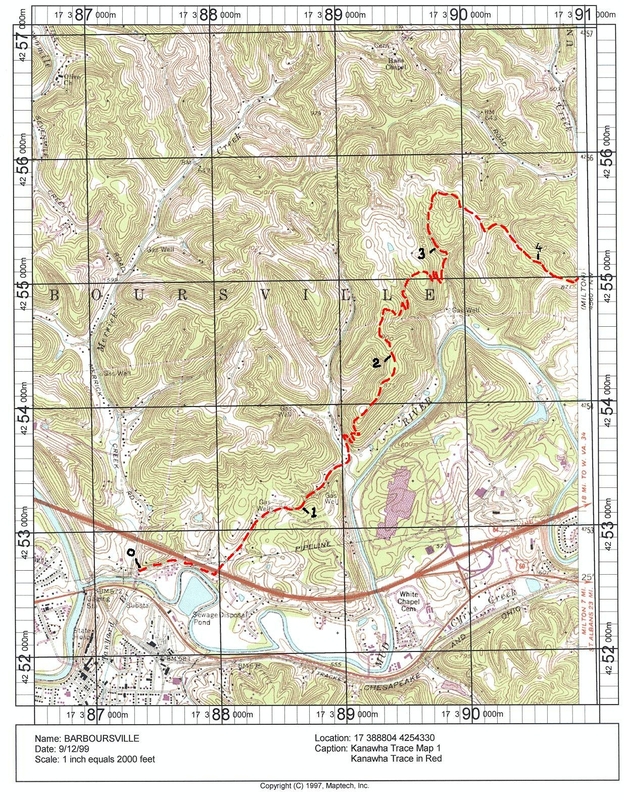 Turn right (uphill) at the 1st fork and you will pass mile 25. At the bottom of the hill, take the left fork and follow the gravel past the houses. This road passes through mile 24 and 23. At the end of this road turn left, staying on this road through mile 22, turning uphill and then right to descend into Bear Hollow. This path is a dried water cascade that resembles a natural staircase. This section follows the trails, sometimes through the creek, and past mile 21 on the road. 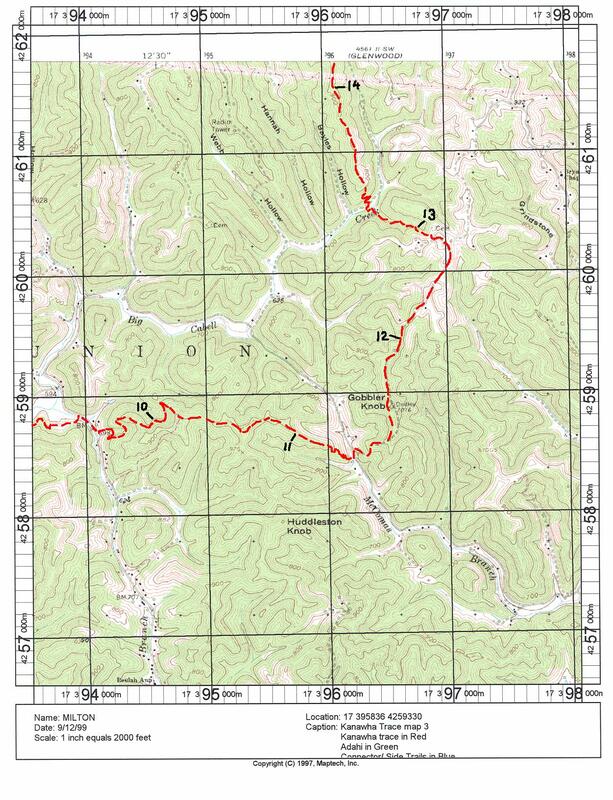 After passing the gas pipe, you will cross a wide creek (there are plans for a future bridge) and climb the hill on the marked logging road. The trail turns right onto a set of switchbacks and skirts below the ridge crest through pine forests. A small descent to a small grassy meadow returns to a logging trail and past mile 20. This trail empties into a meadow with Aid # 3 at the Blackjack Schoolhouse. As you leave, wiggle around the gate and follow the muddy access road. Wiggle around another gate and back onto the blacktop. When the road turns left, stay left and descend into the woods with several ups-and-downs. This trail passes a sign as you enter into Cabell County and past mile 19 before dropping downhill and turning left onto the road. Pass mile 18 on the road and turn right at the fork. Briefly follow the road uphill until the marker points left towards the fields. Wiggle around another gate and past the collapsing barn. Briefly pass through the woods then look for markers on the left side of the field beside the creek. Please try to maintain single file along the creek line to protect the farmers hayfield. 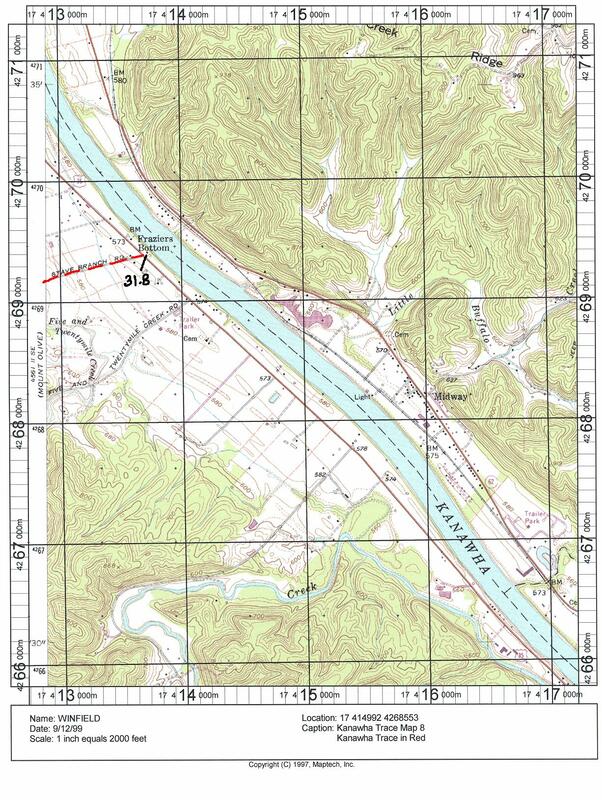 The vulnerable terrain and flood water here make it difficult to maintain the mile 17 marker, but it is in this area. Latch the gate as you pass through. Past the deer tower you will reenter the woods on the right-side of the fence line. Following another logging type road brings numerous creek crossings and fence crossings with steps. Climb the heavy-duty green gate into another field (which may have cows) and pass mile 16. Climb the other green gate to exit the field. There are more creek crossings until you reach another cow field, where you will follow the markers uphill. Past mile 15, use caution crossing the electric fence and turn left on the road. Follow the road until turning right on Barkers Ridge Rd. for Aid # 4. Past the yellow fire station and behind an abandoned store, the trail enters a horse field via a gate (remember to latch the gate after passing through). Follow the trail as it travels the middle of the field and through the red gate on the far end (remember to latch it too). Back into the woods, mile 14 is just past the power line. Follow Brier Ridge as it descends to a gravel road. Cross the road and straight across the field. Cross the creek and follow it as it meanders through hardwoods and rock formations. Go up the hill and pass mile 13. Hurry through the field affectionately known as “Beware of the Bull” and turn left onto the gravel road. This road converts into an asphalt road that passes by mile 12, before turning into a long gravel descent. Turn left across the McComas footbridge and start uphill through the pine thicket. The trail continues uphill and levels out as it passes mile 11. Exit the woods turning right onto a gravel road and hop the small gate onto an asphalt road. Just past the driveway cutoff, the trail reenters the woods onto another old logging road. 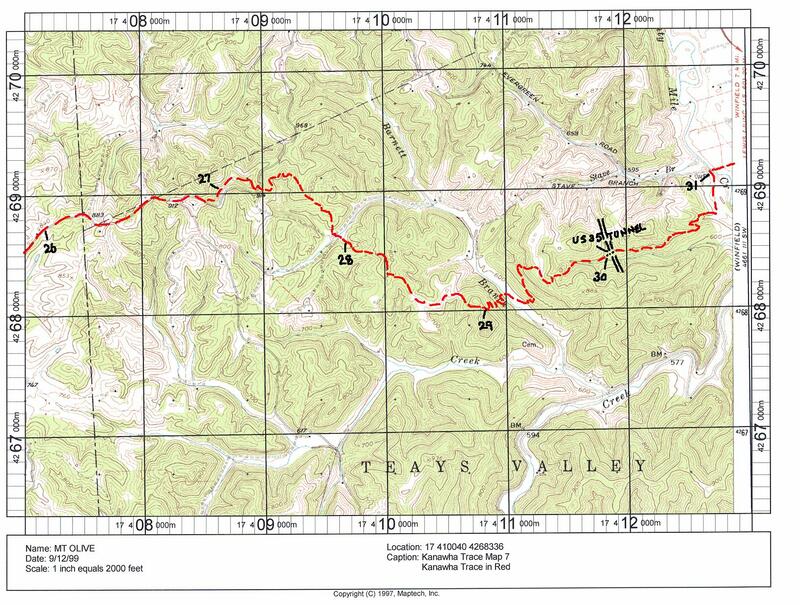 Do not be confused with the trail marker “6” — this is a different trail that bisects the KT. You will soon find mile 10 which is the correct trail. Turn right downhill and to the green overnight shelter. Fresh city water and an outhouse are available at this shelter. Follow the trail as it descends out of Canaan Lands. Enjoy running under the cave and hopefully the water will be coming over the edge so you can get your head wet! Soon you will arrive at Aid # 5 on Howells Mill Road. Turn left at the trail marker and cross the creek. Follow the trail as it begins uphill to a rock formation. Say hello to the gnome for luck! Just past the rock is mile 9. Follow the ridge run and descend to the newly created switchback down to the creek. The trail returns to the gravel road where mile 8 is beside the red gate. Go around the gate and continue to follow the road until an old suspension footbridge. Cross the bridge and go past the barn through a blackberry field. Turn right at the old houses and cross the creek. Pass mile 7 and cross another bridge before heading uphill. On top of the hill is an old abandoned mailbox in the middle of nowhere. 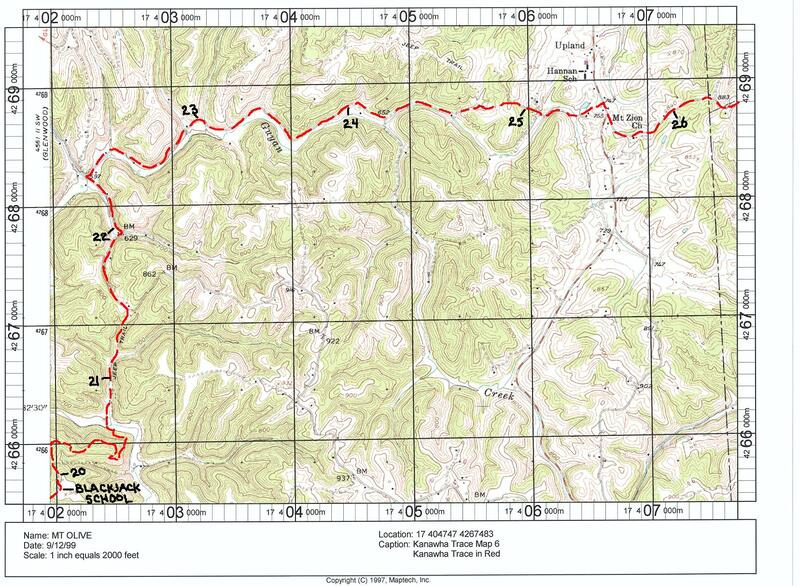 Just before mile 6, leave the KT trail for Old Baldy Trail (blue markers). There will be scouts here to direct the runners in the right direction. Descending the Baldy Trail returns you the KT near an abandoned camp. Turn left and go through mountain laurel and hemlocks. Climb up and through a rock cave. Continue following the creek to the overnight shelter dubbed William’s Shelter. Follow the KT uphill where the scouts will direct you to a different section of trail with blue markers. Follow a ridge which will take you downhill until the trail runs parallel with the river. Pass the active camps, and continue towards the amphitheater and lake area to the Finish. The 25K runners will start with the 10K runners and remain on the KT until they reach the top of Cannan Lands. From this point you will follow an old trail called the Adahi. The Adahi will bring you back into the backside of camp where you will run down along the river to finish the sameway that the 50Ks finish. Remember that your bib is orange so follow the orange flagging. You will run through Linmount community and come out on West Mudriver road and make a right. You will then see a underpass that goes under I-64, you can see Lowes across the river. When you get to the end of that road you will make a right onto wildcat where you will see the Kanawha Trace markers on the trees. Here you will have your first Aid Station this is just a little over a mile at this point. Your looking for a 1-3-1 inch pattern of while-yellow-white. The trail head is at the beginning of this road on your right. From here you follow the markers until you almost reach Williams Shelter on a trail called Laurel Branch you will make a right over a three board bridge, at the top of this hill you will make a left on the gravel road followed by your next right. This path will bring you beside the camp pool into a campground where there is a switchback that comes down behind the pond where the boats are. Next you follow the trail around the pond into the amphitheater for the finish. Remember that your bib is yellow so follow the yellow flagging.